Arcade Fire – Neon Bible: This is your Bible on drugs. Any questions? In Brief: Neon Bible is my least favorite Arcade Fire album, but it’s also the album that got me into the band. Calling it “bad” would be blasphemy. Arcade Fire‘s Neon Bible is one of those records that I’m actually glad I didn’t review back when it was brand new. It’s kind of funny for me to say that when it’s actually the album that got me into the band, but if I’d tried to write about it at the time, my impression of the band would have been that their music was a bunch of doom and gloom with muted colors and only occasional bursts of joyful noise, one which also gave me pause with its seemingly anti-religious statements. Shoot, it would have been even worse when I got around to comparing it to Funeral, an album which I had previously tried and strongly disliked. I’m not afraid to voice an unpopular opinion. But the evolution of my own tastes over the years would have proven me wrong, since Funeral is now one of my favorite records of the 2000s. Neon Bible, on the other hand… well, it had a few songs that at least helped to crack the door open, but in perspective, it’s actually the weakest of Arcade Fire’s three albums thus far. It just hasn’t aged as well as Funeral. But it was a good primer for learning what exactly made this stalwart indie rock band tick, and now seems as good a time as any to revisit it. I suppose I should clarify that my initial misconceptions about Neon Bible no longer apply. There’s actually a lot more color on this album than I had given it credit for. A lot of darkness, too, but the band’s multi-instrumental sound collides with its downbeat musings in unexpected ways. In terms of how strong the individual songs are, it might be inconsistent, but then so is The Suburbs, and I’ve found that to be a fantastic record. Two of the band’s happiest and most hopeful songs – the ones that first turned me on to them – are found here, and they’ve held up well over time as true Arcade Fire classics. Despite Win Butler‘s best attempts to take a more stripped-down approach with this album than he did on Funeral, I credit him for realizing that a lot of these songs still called for big arrangements, full of organs and horns and strings and hurdy-gurdy and glockenspiel and what have you. You’ll hear some delightful sounds here that you won’t catch on other Arcade Fire records. So that’s complaint #1 refuted – even if sometimes the occasional song will still strike me as a bit too murky for its own good. As for the anti-religious sentiment… that’s not it at all. Win Butler and co. certainly have some harsh words for those who would let the appearance of piety override the need for common human decency, but that’s sort of the entire point of Neon Bible – the slow, insidious infiltration of gaudy popular culture into religion (at least in the modern North American culture that these guys are exposed to) that dilutes its meaning and results in these out-of-whack priorities. There’s still a longer for something greater than oneself driving several of these tracks, though the band might be a bit glum over their prospects of actually attaining it. That’s OK. A little wake-up call warning us that churches aren’t supposed to be three-ring circuses and preachers aren’t supposed to be revered for their celebrity can be good medicine at times. On that topic, it’s not as jarring an examination of Jesus junk as U2‘s Pop was ten years prior… and boy, there’s an album I’ve come to love and defend after initially being offended and put off by it. It’s somewhat ironic that Neon Bible, due to Arcade Fire’s inherent musical fervor, can come across as overly preachy at times, but if you’ve heard anything else by the band, you probably already know this and know whether you can handle it. That sort of melodrama is just hard-wired into their DNA. And once you get used to it, despite how deadly serious it all sounds, it’s actually kinda fun, too. 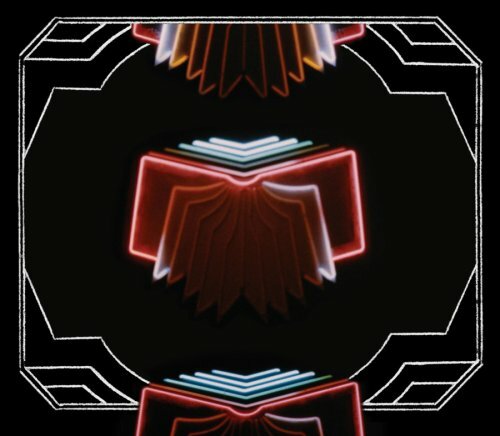 Part of the blame for my perception of Neon Bible as a whole being an album full of darkness and muted colors is because of its opening track, which I still sort of feel that way about. It’s uptempo, and even melodically interesting due to the carnival-like and slightly unnerving piano melody that runs up and down throughout it. But it takes a while to fully notice and appreciate how many instruments are contributing to its twisted sound – the strings, the wiry electric guitar, the menacing background vocals, etc. Production-wise, it all seems to slowly emerge from a sea of noise and then slowly collapse back into it. That may be fitting for a song that’s all about the ocean acting as a dark, indifferent mirror reflecting back the most wretched aspects of the human soul. It’s an important place to start the album, thematically speaking. But compare it to the raucous “Neighborhood #1 (Tunnels)”, or the laid-back yet bouncy “The Suburbs”, and “Black Mirror” comes out as the weakest and least iconic opening track on an Arcade Fire album thus far. This was the first Arcade Fire song to really get my attention. Unsurprisingly, it’s one of their most upbeat and hopeful songs, which is perhaps kind of a dumb thing to look for when you’re trying to get into a band like this, but I’m far from being the only person who agrees that it’s one of their best songs. From its opening seconds, with the strings fluttering about and an acoustic guitar and what I think is a mandolin laying down the rhythm, it’s got an addictive sense of motion to it, which fits Win Butler’s lyrics like a glove. Even at his most optimistic, he’s still musing about death and paranoia, as if he’s aware that the Grim Reaper himself could show up at his doorstep at any moment. Yet, he seems to have one foot in the afterlife already, so there’s a part of him that seems prepared, even excited, to get a glimpse into the world beyond mortal life. This is what I assume “Keep the car running” means – always be ready to leave the life you know behind at a moment’s notice. (Or else he could be trying to escape that fate. Ironically, it’s a life-affirming sentiment either way.) The drums, with their relentless, pounding rhythm that increases ever-so-steadily as the song comes to a frenzied boil, contribute a great deal to the infectious nature of it. It’s loaded with unconventional instrumentation and yet it’s probably one of the most straightforward songs that Arcade Fire has put out there for the world at large to consume thus far. So it’s a perfect gateway drug – it gets you to stick around and listen to the less conventional and/or catchy stuff that follows. The title track is, unfortunately, a real misfire. It might just be its placement so early in the album, or the fact that it’s surrounded by two anthemic and rather monolithic songs, but something about its acoustic muted nature just feels a bit off. Its short length and the fact that it’s the album’s title track also work against it – this is supposed to the album’s thematic center, which helps to illuminate its very reason for existence, but instead it feels like an afterthought, a detour, a resigned and half-hearted sentiment that could well have been left as a B-side. Win’s practically whispering the lyrics, which are about a glowing, poisonous tome that seems to lure him in at the dead of night, a twisted reflection of a religious document that fills him with dread instead of hope. “Not much chance for survival if the Neon Bible is right”, he laments. And as much as I think he might oversell it on some of the other songs, he seems to be vastly underselling it here. This is one of those songs that really startled me, and perhaps even offended me a little at first, but now I can totally see where it’s coming from. Musically, I never doubted that it was pretty awesome. How could it not be, with the big, blaring pipe organ at the beginning? Not only is that an under-used instrument in rock & roll (understandable, since it requires an entire building to support it and thus isn’t particularly portable, plus it sounds like the type of music that for so many years, seemed like the traditional enemy of rock & roll), but the huge, cavernous sound it creates here immediately whisks you away to some vast sanctuary. Rather than playing it for shock and awe, though, it becomes the backdrop for one of Win’s most bitter songs, as he seeks to dismantle a charismatic preacher whose job apparently leads him to completely neglect his home life. This would be where I think he oversells it a bit, since the main chorus finds him yelping in frustration, “Working for the church while your family DIES!” (It’s even more bizarre when Régine Chassagne chimes in later, echoing Win’s statements in an unsettlingly pretty fashion). I’ve been going to churches long enough to see some of this happen – preachers can become workaholics or get inflated egos when everyone tells them how great they are and want them to speak at various conferences and whatnot, just like what can happen to laymen in so many branches of the business world. The extra danger lies in the belief that it’s OK to pour everything into “God’s work” and leave one’s marriage and one’s parental duties to rot back at home. It’s sad, but unfortunately it’s a real problem, and as much as it hurts to hear the criticism from “outside”, it’s a fair enough criticism. It’s just the “death” angle that might be overstating it a bit – metaphorically I suppose it’s true that these people are dying on the inside. But the way he sings it, I want to tell the guy to take some Prozac already. In spite of that. It’s an amazing song that doesn’t skimp on the bells and strings and other beautiful sounds, just to make the light shining through those stained glass windows that much more harsh and uncomfortable. Aside from a few stray lines in “Black Mirror”, this was my first taste of Arcade’s Fire’s French/English hybrid songs. There seems to be at least one per album, and at first, I didn’t understand the band’s cultural background (they’re from Montreal, and Régine, who sings the lead vocal in the first half of the song, is originally from Haiti), so I thought it was mildly pretentious to keep casually slipping back and forth between the two languages. (I’ll admit that some of it still sounds awkward to me. Did she just sing about a loogie? Oh, that’s a French word. Never mind.) What starts out as some sort of bizarre, upbeat hybrid of baroque pop and New Wave slows down rather suddenly midway through, grafting itself on to a completely different song which finds Win once again at his most pessimistic: “Stop now, before it’s too late/You’re eating in the ghetto on a hunderd dollar plate/Nothing lasts forever, that’s the way it’s gotta be/There’s a great black wave in the middle of the sea.” The way his vocals eventually intertwine with his wife’s is kind of neat, and I can’t complain too much about a song being schizophrenic when it’s got two titles (plus, being more used to Arcade Fire, I know that they have a habit of changing up a song’s rhythm completely near the end of it, so it’s not that abnormal for them), but this one still feels like a bit of a misfit to me. It’s interesting to listen to, but I never seem to fully grab hold of it before it falls apart. This was the first of Arcade Fire’s more down-tempo tracks that I really got into. As the sounds of thunder and static take us out into the middle of that dark ocean, a seductive bass line comes creeping in, sounding somewhere between the bossa nova and a Johnny Cash ballad, if that makes any sense at all. Electronic keyboards chime in here and there, and overall it’s a fascinating sonic stew that manages to make all of Win’s brooding so much more believable. His mood here is cold and distance, knowing there’s w rodl of miscommunication and even violence separating him from someone he loves, but he’s not quite able to own up to it and admit the truth yet: “You’ve got your reasons/And me, I’ve got mine/But all the reasons I gave/Were just lies to buy myself some time.” As the track gradually brightens with the addition of piano and a mariachi-style horn section that brings us to a surprising climax, it becomes more cautiously hopeful. What he could have let fall apart, he now chooses to actively fight to keep, as he cries out, “I’m gonna work it out/’Cause time won’t work it out for you!” it’s a euphoric release of emotion at the end of a song that I honestly wouldn’t have expected that from. This has been one of my personal favorites for years, and yet somehow I didn’t know until just recently that Calexico had done an admirable cover version of it as a B-side for the “Intervention” single. Normally I wouldn’t think the two bands were anything like each other, but with the brooding, hushed vocals at the beginning of it and the horns at the end, it makes total sense to me that this would be right up Calexico’s alley. I didn’t really know what to make of this one at first. I liked about half the song, and then it seemed to switch gears just like “Black Wave/Bad Vibrations”. Once I got more into Funeral, I started to see the song as the inverse of “Crown of Love” on a musical level, with the first segment having a fast-paced rhythm and the second segment more laid-back, in 6/8 time. I didn’t realize until just now, honestly, that “The Well” and “The Lighthouse” may well be two separate songs crammed together into one track. Looking at the lyrics, the story of a man lured into a well by a woman’s voice (I love how Régine chimes in to play that voice briefly in each verse) and finding himself trapped down there seems unrelated to the story of a lighthouse whose keepers fear what will happen to ships if they abandon it. Though the song has its musical and vocal flourishes, and I love how it eventually fades into dreamland on its increasingly wobbly melody, the bulk of the song never really seems to stand out to me. It’s an interesting, but ultimately forgettable song since it doesn’t give you enough of either half of it to really stick in your brain, nor does it tie the two together in any way that I can tell. Here’s where the gloves really come off. With an up-tempo acoustic guitar strum, and a song structure that almost feels like a protest song due to its lack of a chorus and its verses that keep piling horrible details on to an unsettling story, Win proceeds to dismantle a greedy father who pimps out his daughter’s vocal talent for cash while maintaining that he’s doing the will of God. It’s a not-so-veiled jab at the father of Jessica Simpson, or so I’ve been told. The interesting thing is that the story’s all told in the first person, from this man’s younger years straining to get by in a crummy minimum wage job, to the position of privilege he finds himself in when he discovers the cash cow living under his own roof. You haven’t even heard half the story when it starts to take a sour turn with these lines: “Oh God, would you send me a child?’/Cause I wanna put it up on the TV screen/So the world can see what your true word means.” From there, things get progressively more uncomfortable as he coerces the child to keep working with whatever guilt trips he can conjure up, only to finally realize at the end of it all, “Oh, tell me Lord, am I the Antichrist?” Throughout it all there’s a very prominent bass line, and a few instrumental breaks where the piano and some uncharacteristically hyperactive background vocals from the ladies really get to stand out, as the song builds in intensity towards its abrupt ending. This one felt a bit icky at first, but its gone on to become one of my favorites on the album. We jump back into a comparatively mellow mood here, which makes it all too easy to miss a rant that probably would have kicked up a bit of controversy if it had accompanied a radio-friendly song. What starts with a repetitive pattern of guitar repeating two notes gets more complex as it goes, eventually bringing in some nice orchestral flourishes, and a little bit of that “gang of musicians” sound that made so many of the tracks on Funeral seem larger than life. It just takes a bit to get there, because at first Win’s so beaten down, mulling over all of the aspects of Western society that he’s sick of. He sounds a lot like a prodigal son who has just told the old man where to stick it and headed for the nearest border crossing, as he gripes “I don’t want to live in my father’s house no more”, later making this more painfully specific as he changes it to, “I don’t wanna live in America no more.” (This is where I have to separate character from storyteller, though it is interesting to note that Win and his brother Will Butler, also a member of the band, are transplants from Houston now living in Quebec. Make of that what you will.) By the end of the song, he’s practically begging for World War III to come and end this commercially-minded, celebrity obsessed culture, this uneasy conflation of religion and patriotism that rubs him the wrong way. I’m so used to taking stuff like this as a metaphor nowadays that I have to stop and think for a second to realize how disturbing the implications of this song would be if you took it all literally. (Some Fox News correspondent could probably have a field day with these lyrics.) Thankfully, before I get to deep into that, there’s a much more hopeful song swooping in to save the day. Oh man… this song just hits me where it counts, on so many levels. Right from that first organ note that grandly heralds the arrival of a joyous, celebratory refrain, I’m totally in love with it. It’s just so friggin’ perfect… the horns and accordion ringing out over the mountaintops, the powerful, rolling drums that keep chugging forward like a train barreling down a hill, the exuberant group vocals and shouts that give us a break from Win’s meaningful but often cold and isolated musings… shoot, even the minimal, repetitive lyrics (the kind of thing I’d normally penalize a long, epic song like this for) play their role perfectly by giving us a vision of a celestial place that literally no mode of human transportation, from cars to submarines to spaceships, can reach. It’s like the rapture in musical form, except not excluding anybody – old and young, boys and girls, Christians and pagans and atheists, and anyone I failed to mention, all seem to be recipients of this excited invitation. (I have to imagine most of the subtext, given the minimal lyrics, but if ever a song was to succeed in personifying utopia, this would be the one.) Just when you think it’s winding down as Win and Régine start to repeat their mantra “Between the click of the light and the start of the dream”, whisking you back to memories of your mom tucking you in for bed at night, there are these stuttering synth notes that pick up from that point and just sort of run away with the song, meshing beautifully with the horns and other symphonic elements that threaten to blow the roof off of any venue in which this tune could ever be performed. It’s so exhilirating that I feel like it would have ended the album perfectly. It seems weird to try to follow this up with anything, because it’s like the perfectly engineered encore song, thank you every city on Earth, have a good night and we’ll see you in the next life. The song that actually closes the album is not a bad song by any stretch. It just seems like a cruel twist of fate to come crashing down back to some quiet, lonely place on planet Earth after that huge climactic rush. Over little more than thumping bass and synth notes, Win mourns the limited nature of his human body, the cage which “keeps me from dancing with the one I love… but my mind holds the key.” It’s like we couldn’t end the album without a cold splash of water in the face reminding us that we’re still stuck here on this mortal coil for the foreseeable future. This one isn’t without its grandiose drama, quite suddenly moving from its cold and insular mood to a colorful fireworks display of horns, crashing drums, creepy organ, and ominous choral vocals. It could almost be the score to a scene from some monster movie where a guy wakes up and realizes his body has become some mad scientist’s experiment. It’s torture for him, yet there’s that faint glimmer of hope, that willpower to escape his limitations and become something more. So what seems like a downer at first actually turns out to be a hopeful ending – a flawed one, perhaps, but a curious and creative final flourish nonetheless. I could see how, if you felt more strongly about the finale, you might rate the album overall higher as a result. I’m actually surprised, re-reading a review I wrote six years ago, that my own opinion on it hasn’t changed too much. I feel like I’m a lot more into Arcade Fire now than I was when I wrote this.